Polymer researcher Will Dichtel wants to help students see that organic chemistry isn’t just a rite of passage on the path to medical school; it’s fundamental to a good education. Ask pre-meds at Northwestern, or almost anywhere, which requirement they dread most, and a lot of students will name the same course: organic chemistry. Chemistry professor (and 2015 MacArthur “genius”) Will Dichtel wants students to see that surviving “orgo” is not just an unfortunate rite of passage on the trek to medical school. Dichtel aims to convince students that studying organic chemistry is essential to understanding the world — as fundamental as, say, thinking critically about Hamlet, learning a new language or grasping how compound interest works. To illustrate how often organic chemicals affect our lives, Dichtel profiles a “molecule of the day” when he teaches undergraduates. For example, he shows the similarity between the allergy medications Claritin and Clarinex (loratadine and desloratadine), and he tells this story: When best-selling Claritin went off patent in 2002, manufacturer Schering-Plough knew that low-cost generics would soon appear on supermarket shelves. So the company introduced a new allergy drug — expensive, prescription-only Clarinex. Dichtel gets his inspiration for other “molecules of the day” from current events and the calendar. If the Green Bay Packers are Super Bowl contenders, Dichtel unpacks the dye molecule that turns Wisconsin cheddar cheese orange. He marks Valentine’s Day by introducing oxytocin, the bonding hormone. For Dichtel’s group, that enterprise is “trying to do things that haven’t been done before.” He and his team of a dozen graduate students and postdoctoral researchers use their intuitions about chemistry to build altogether new materials, explore their properties and devise ways of using them. To build these materials, they tweak small molecules composed of plentiful elements that rank low on the periodic table — always carbon, plus other lightweight elements such as hydrogen, nitrogen, oxygen and boron. These molecules link to form stable networks of repeated units called polymers. 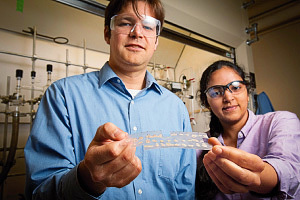 Many polymers line up like beads on a string, but Dichtel’s lab builds polymers that form two-dimensional grids or three-dimensional scaffolds. These structures are called covalent organic frameworks, or COFs. To visualize one of these tiny frameworks, imagine a honeycomb. Then picture it shrinking, so that it can be seen only through an electron microscope. The frameworks are full of pores, and that’s what makes them useful. All those pores create a lot of surface area in a very small space. For example, a small amount of fluffy COF powder, just enough to fill a shot glass and weighing the same as a dollar bill, has the surface area of an Olympic swimming pool. The Dichtel group has used this porosity in various ways. One new material acts as a battery that charges in seconds. Another does the work of bomb-sniffing dogs by detecting the volatile compounds emitted by explosives. The group’s inventions belong to a lineage that began with the creation of nylon, the first fully synthetic organic polymer. Models playing tug-of-war with nylon stockings first introduced the material at the 1939 World’s Fair. Now, Dichtel and his group are among the pioneering developers of COFs, first reported in 2005. “We’ve had 100 years of polymer chemistry, and to have a new class of polymers that’s only a decade old? That’s really young!” says Dichtel. The Dichtel group has invented another porous material, based on sugars found in cornstarch, that could help to address an emerging crisis: the discovery of trace organic compounds that pollute public water systems. When water flows through this new material, contaminants such as pesticides interact strongly with its many pores. The impurities don’t bond with the material chemically, but rather physically: they cling to the pores, which are perfectly-sized binding sites shaped like cups. Because the polymer’s high surface area allows pollutants to access the pores instantaneously, this happens very quickly. This process offers two advantages over activated charcoal, now widely used to filter water. Organic pollutants bind more securely to this new material than to activated charcoal, and, once full of contaminants, the material can be rinsed and re-used without burning much energy. In addition, the cost of the polymer is low: it is a modification of a common sugar molecule (beta-cyclodextrin). On Jan. 14, the prestigious journal Nature featured the discovery on its cover. 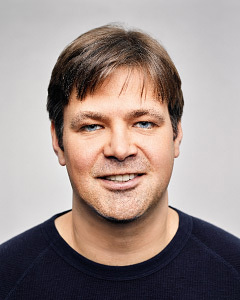 In addition to supervising the research in his lab, Dichtel spends his time writing articles and grant proposals, teaching courses and speaking at conferences around the country. Whether he’s addressing fellow chemists, scientists from other fields or college sophomores, he must imagine what his audiences know and what they don’t. A crucial audience is committee members who control money for research. “That’s what makes the lab go,” he says. When he really needs an escape, he loves open-water swimming. Dichtel has heard there’s a big lake somewhere east of the Northwestern campus. He plans to investigate. Northwestern researchers have developed a completely new hybrid polymer that could soon be used to create artificial muscles, reusable energy sources and self-repairing materials. The breakthrough was published in the journal Science in January. The key to the new polymer? Nano-sized compartments that can be removed and chemically regenerated multiple times, says Professor Samuel I. Stupp, senior author of the study. The new material cleverly combines the two types of known polymers: those formed with strong covalent bonds and those formed with weak non-covalent bonds, known as “supramolecular polymers.” The integrated polymer offers two distinct “compartments” that can be instilled with useful features. “Growing the two types of polymers simultaneously generates a structure that is completely different from the two grown alone,” Stupp explains. Stupp says the new polymer could lead to a “super-smart patch for drug delivery, where you load the patch with different medications and then reload it in the exact same compartments when the medicine is gone; or to solar energy materials for which parts damaged by sunlight can be replaced.” It could also be used to create materials that function like artificial muscles, flexing rapidly and reversibly like the muscles in the body. “Our discovery could transform the world of polymers and start a third chapter in their history: that of the ‘hybrid polymer,’” Stupp says.